In the spring of 1898, a small mining boom took place in the area surrounding Lac du Bonnet and the Winnipeg River system that would impact on the region for years to come. In the same year, a group of men from Winnipeg and the Lac du Bonnet area had a vision for the future development of the natural resources. They formed the Lac du Bonnet Mining, Developing and Manufacturing Company, and as part of their enterprise, would extract clay from the banks of the Winnipeg River to manufacture bricks. A few acres of bush had been cleared away, clay samples taken and sent to the USA to be tested for suitability. On receiving a favourable report, the company immediately ordered the necessary machinery from a USA manufacturer. A winter sled road was built along the old Manitoba-Ontario boundary from Lac du Bonnet to Shelly on the Canadian Pacific Railway (CPR) line on which to bring in the new equipment. Saw logs were also cut and hauled on this road for the construction of new buildings. When the machinery arrived, a crew from Eastern Canada was hired to assemble the plant. With the building of the branch line from Molson, on the CPR line, to Lac du Bonnet (1898-1901), the necessary direct access to the outside market was available. In 1901, J. D. McArthur bought the entire holdings of the Lac du Bonnet Mining, Developing and Manufacturing Company, which consisted of 810 hectares (2,000 acres) of prime timber land and the brick manufacturing plant. From the time the plant went into operation, it played a major role in the economy of the area and, by 1919, employed upwards of 50 men. The company produced bricks until 1920 when it was decided that the venture was no longer viable. For years following, left over bricks were given away, free for the taking, to residents of the area for the construction of local chimneys, etc. 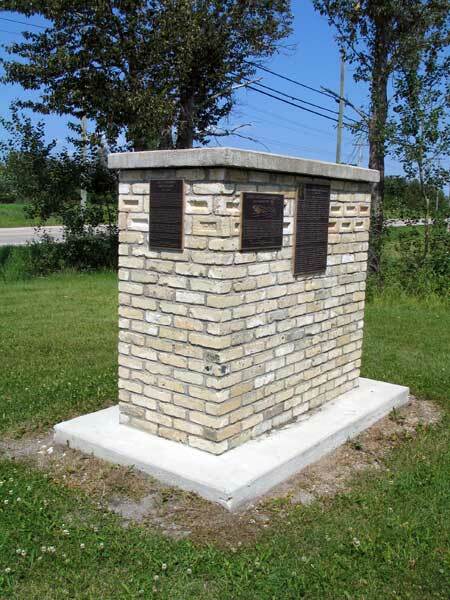 Some of the bricks used in the construction of this monument were manufactured at the Lac du Bonnet Brick Plant.